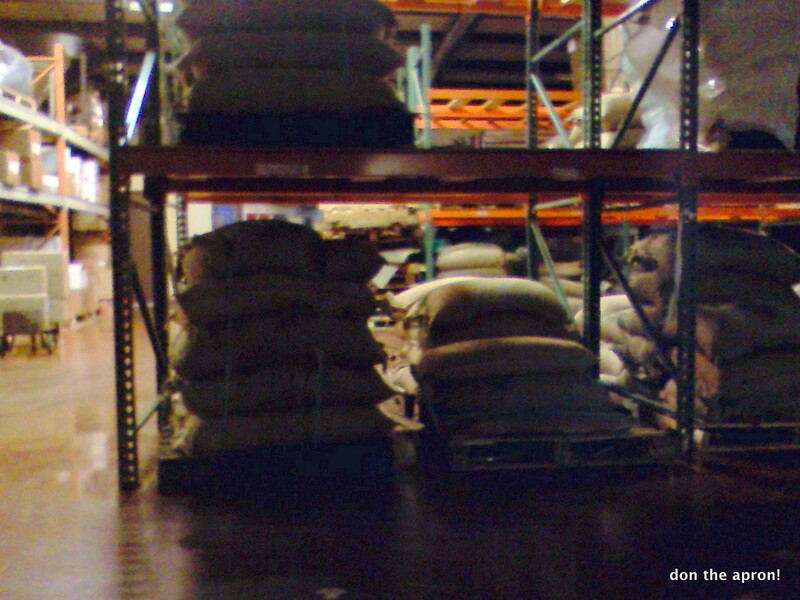 Coffee Cupping at Counter Culture Coffee – Durham, NC | Don the Apron! For those of you who are unfamiliar with a coffee cupping, imagine a wine tasting, except with coffee. Participants observe the coffee’s tastes and aromas, usually in comparison to other beans. Cuppings are how coffee buyers decide which beans they’ll purchase in the field, giving them a low-tech yet efficient way to understand the nuances of the beans presented to them — particularly optimal if they’re in rural areas on purchase trips. Smelling — the nose knows. Inhale deeply to get a good gauge of scent. Fragrance — we started with the dry coffee grounds in a cup. Holding the cup in one hand, slam it down purposefully on a countertop, stick your nose in the cup, and sniff deeply. Aroma — the grounds were then covered in just-boiling water, and we smelled the coffee when wet. Break — a crust of carbon dioxide and grounds form on top of the cup. We analyzed the scents that developed when “breaking” this crust with a spoon. Tasting — the crust/foam is then spooned off of each cup, leaving just the coffee. Taking a generous spoonful of the liquid, slurp it loudly and quickly in order to allow the coffee to make contact with your whole tongue for maximum tasting. Brightness — how bright, or punchy, is the coffee’s initial taste? Flavor — use any descriptors, from sweet to savory, how would you describe the coffee’s flavor? Body — how does the coffee feel in your mouth? Aftertaste — after swallowing, how long does the taste last, and how does it change? After the cupping, one of their employees went over some coffee production basics (sundried vs. washed processing), answered questions, and discussed their business. If you ask, they will take you on an optional short tour of their roasting/packaging facilities. The Durham location serves many purposes: national administrative headquarters, home to coffee cuppings, training ground for local baristas, and their only roasting center. Counter Culture has a really wonderful packaging aesthetic. The bags are banded by an actual wine label, where each type of coffee is branded in-house with a logo that represents the region the coffee was sourced from. For instance, the bag for the Ceneproc featured a design inspired by a local textile purchased by our cupping instructor at the local market when she was in Bolivia purchasing the beans. The label also contains additional information about the region, beans, cooperative, and Counter Culture, meant to raise the discourse around drinking coffee. 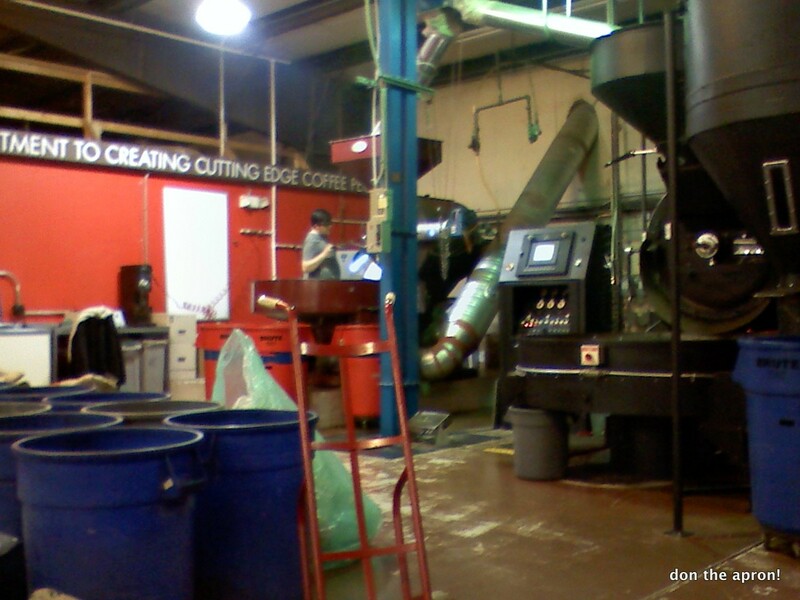 Here you can see two of their three roasters: the reddish one where the man is checking on the currently roasting beans, and the largest black roaster to the right. The coffee beans are handled in the large trash cans, with each color (blue, grey and red) representing a type of bean (I believe it was organic, regular, and decaf, but don’t quote me on that). I am fortunate enough to have several friends who are absolutely bananas over a good cup, including one who spent several years managing a local coffee shop, another that home roasts his own beans, and Kris and Maher, who blog, blend and brew over at Cafe Hound. It’s because of these people that I began to appreciate coffee for more than just a caffeine vehicle, but as a complex drink that can both pick up my spirits and reduce poverty. I still am an extreme coffee novice — however, this class allowed me to indulge my perpetual curiosity for all things food and drink, and pick up some new knowledge. I have honestly never really been able to taste too much of a difference between coffees before (a wonderful breakfast experience with an Ethiopian coffee Ben made for me standing out of the milieu), but at CC I began to really pick apart some of the nuances. This is likely a function of their superior product, as well as good teaching and contagious enthusiasm for coffee. I appreciate the fact Counter Culture offers this for free, and look forward to heading back a few more times this year! Coffee cuppings are free at Counter Culture, and held weekly at 10am on Fridays at all their locations: Atlanta, GA; Asheville, NC; Charlotte, NC; Durham, NC; New York City, NY (cuppings at noon on Fridays); and Washington D.C. If you don’t have a CCC location close by, check local roasters and coffee shops for any cuppings they may be hosting! This entry was posted in Beverage, Blog, Field Trip by Lin. Bookmark the permalink. The chalkboard is so colorful! This sounds cool and slightly more sophisticated than the one that was held at IR/PS. The space it was held in was pretty fantastic – they also train baristas for national competitions there! 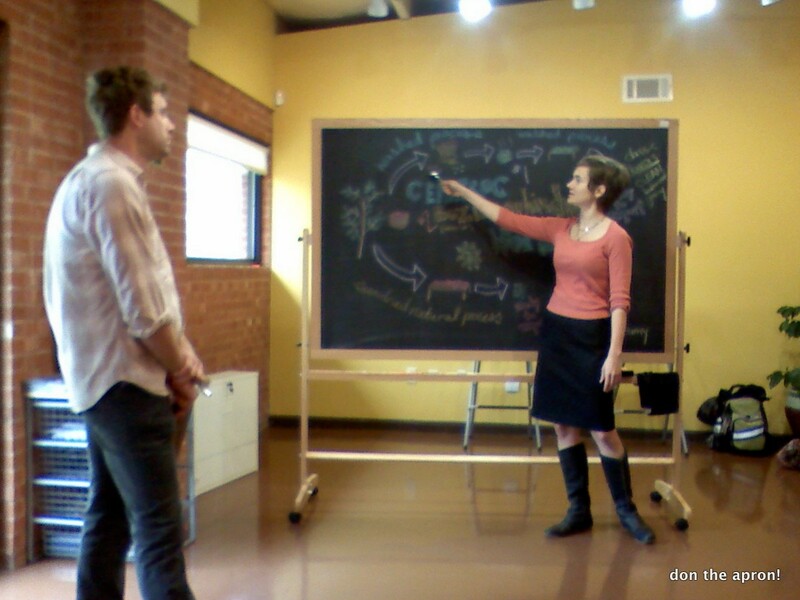 And the lady who presented was the chalk artist, she was finishing up her coffee processing diagram when I showed up that morning 🙂 It was definitely cool and a fun thing to get to do… Makes me want to be on the lookout for more of these classes! Pingback: A Durham/Chapel Hill Food Lover’s Gift Guide | Don the Apron!